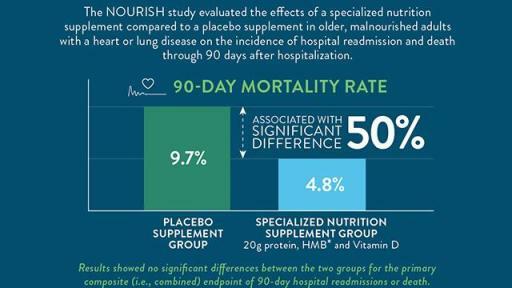 Results from a new clinical trial show that a specialized oral nutrition supplement was associated with a 50 percent lower death rate in older malnourished patients with a heart or lung disease 90 days following hospitalization. The study, published online today in Clinical Nutrition and supported by Abbott, estimated that within this population one life could be saved for every 21 patients who received the specialized nutrition supplement, demonstrating it as a highly effective therapy. 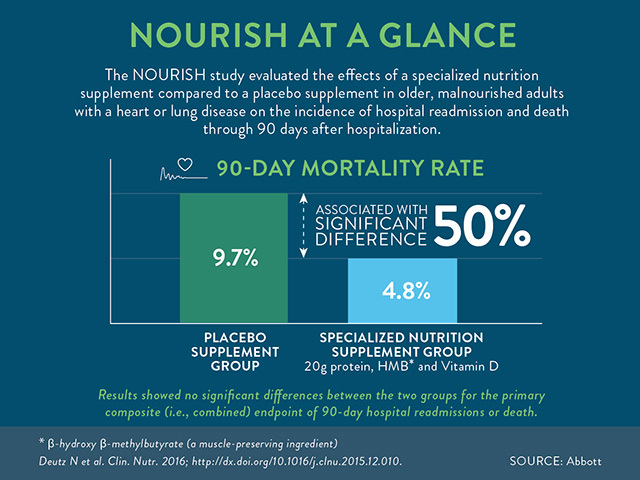 The NOURISH (Nutrition effect On Unplanned ReadmIssions and Survival in Hospitalized patients) study – one of the largest nutrition clinical studies of its kind – was a prospective, randomized, double-blind, placebo-controlled trial. The study was designed to build upon the body of evidence demonstrating that oral nutrition supplements may reduce complications, mortality and hospital readmissions in malnourished patients. Participants in the NOURISH study included 652 malnourished adults, aged 65 or older, who were admitted to the hospital and suffered from heart or lung disease. Researchers compared the effects of a specialized nutrition supplement with high protein (20 grams), HMB* (a muscle-preserving ingredient) and Vitamin D to a placebo supplement on rates of readmissions or death 90-days after leaving the hospital. A significantly lower (50 percent) death rate for those patients who received the specialized nutrition supplement. This lower incidence of death began at 30 days and continued for 90 days after participants left the hospital. Similar rates of hospital readmissions between the two groups. Improvements in other health outcomes including body weight, nutritional status and Vitamin D levels at 30 and 60 days after leaving the hospital, and continued body weight and nutritional status improvements at 90 days for the group taking the specialized nutrition supplement. "The NOURISH study clearly reinforces the power of nutrition in impacting health outcomes. For the people in this study who were ill and malnourished, nutrition was critical to survival because it helps keep your body, especially your muscles, functioning properly," said Nicolaas E. Deutz, MD, PhD, Center for Translational Research in Aging & Longevity, Department of Health and Kinesiology, Texas A&M University, and lead study author. "This is more proof that we need to change the standard and include nutrition as an integral part of care, much like flu shots or aspirin, to help older adults who already have or are at risk for malnutrition and chronic illness." 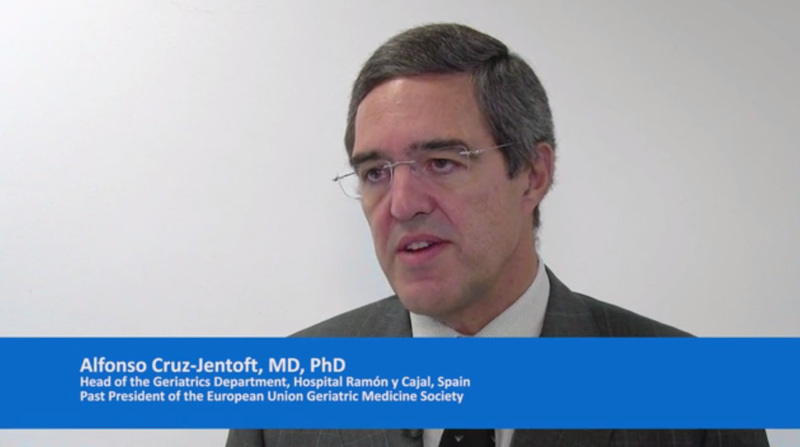 "Surprisingly, malnutrition in older adults is very common – and it’s a condition that is having a rippling effect on our health and health system," said Alfonso Cruz-Jentoft, MD, PhD, head of the Geriatrics Department, Hospital Ramón y Cajal, Spain, and past president of the European Union Geriatric Medicine Society. He was not involved in the study. "People underestimate how critical strength and muscle health are to recovery from hospitalization and illness. Proper nourishment is a key component and cannot be left out of the conversation." The NOURISH study builds upon existing research that shows the role nutrition plays in a patient’s health, ranging from rebuilding muscle mass to helping with recovery from disease and time in the hospital. The nutrients in the specialized nutrition supplement used in the study – protein, HMB and Vitamin D – are all important components in repairing and rebuilding muscle while recovering from hospitalization and illness. "As medicine has advanced, so has the science of nutrition. We know proper nutrition is foundational for good health, but the medical community and patients don’t always turn to it when recovering from a health issue like pneumonia," said Refaat Hegazi, MD, PhD, Abbott medical director and study author. "While the prevalence of malnutrition is high, research shows that less than two percent of malnourished patients in the hospital receive an oral nutrition supplement. Nutrition must be one of our critical tools to help adults live longer, better lives." The commercially available versions of the specialized nutrition supplement evaluated in the study are Ensure® Plus Advance in Europe, and it will be available this year as Ensure® Enlive® in the United States. The specialized nutrition supplement is also expected to be available in other countries around the world in the next couple of years. The NOURISH study was a prospective, randomized, double-blind, placebo-controlled trial conducted in the United States between May 2012 and October 2014 across 78 different U.S. hospitals and sites. 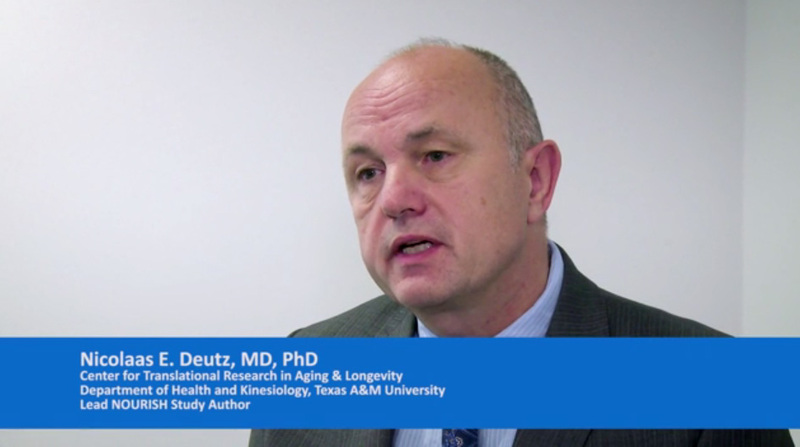 Researchers evaluated the impact of Abbott’s specialized nutrition supplement with high protein, HMB and Vitamin D compared to a placebo supplement on rates of death or readmissions 90 days after hospitalization. Researchers from institutions including Texas A&M University, Medical University of South Carolina, East Carolina University, University of Illinois at Urbana-Champaign, and Emory University School of Medicine evaluated 652 malnourished adults aged 65 or older admitted to the hospital with conditions that have previously been shown to result in a high risk of readmission: congestive heart failure, acute myocardial infarction (AMI/heart attack), pneumonia or chronic obstructive pulmonary disease (COPD). Study participants were randomly assigned to receive the specialized nutrition supplement or placebo supplement, twice a day within 72 hours of hospitalization and continued for 90 days after leaving the hospital. Both groups also received standard nutrition care and medical care prescribed by their physician. The study’s primary composite endpoint evaluated the incidence of death or non-elective hospital readmissions 90-days after a patient left the hospital. Other endpoints included 30- and 60-day incidence of death or readmission, hospital length of stay (LOS), activities of daily living, body weight, Vitamin D levels and nutritional status using the Subjective Global Assessment (SGA), a validated tool that is considered the gold standard for assessment of malnutrition in hospitalized patients. Coats KG et al. J Am Diet Assoc. 1993; 93: 27-33. Giner M et al. Nutrition. 1996; 12: 23-29. Norman K et al. Clin. Nutr. 2008; 27: 5-15. Lim SL, et al. Clin. Nutr. 2012;31(3):345-50. Gariballa Set al. Clin. Nutr. 2013;32(5):772-776. Deutz N et al. Clin. Nutr. 2013; 32: 704-712.